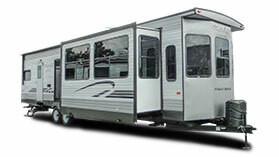 Destination RVs, or luxury RVs, are top-of-the-line recreational vehicles. 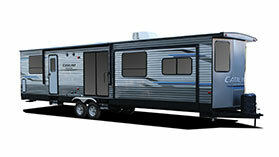 Destination RVs offer all the features, space, and comforts of home. Discover high-quality details like higher ceilings, stainless steel appliances, skylights, and extra lighting. You'll never want to leave! Cedar Creek Cottage is pure luxury; all details are covered. 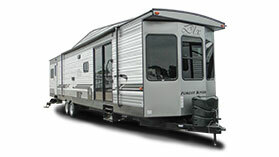 Forest River Cherokee trailers offer comfort, style, and value. 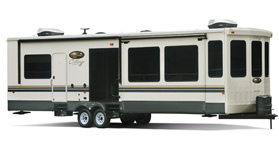 The Coachmen Catalina is a versatile destination travel trailer. 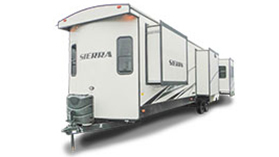 The Sierra is spacious, inviting, and attractively priced. For quality, convenience, and ultra comfort, choose Wildwood DLX. The Wildwood Lodge is the ultimate in destination camping.